A few weeks ago I allowed a disgruntled employee at one of my favorites restaurants to ruin my weekend. Most of that Saturday had already proven to be a “bad day for German” and it showed while I was ordering my food. I was slow to understand, the employee lost his patience, and let me have it in front of everyone around me – in English. Had I brought my bag of steel nerves and quick thinking I would’ve totally handled the situation. I would have said something like, “Thank you for my mineral water. And what’s your name? Michael? Great. I look forward to speaking with your manager, Michael. Have a nice night.” Wah-BAM. He would have been speechless! But let’s face it – the only time I’m able to think on my feet like that is when I encounter someone smaller than me, like kids who talk during opening night of the final Harry Potter movie (ask my husband about it sometime). Even if I had talked to the restaurant manager, I still don’t think it would have made me feel any better. The guy probably had a rough day, and it wouldn’t have changed the fact that my German was far from on target. Good friends comforted me with German-learning-struggle-stories of their own, and while that helped a considerable amount, I couldn’t help but keep thinking to myself, “What is the deal. Just open your mouth already and SAY SOMETHING.” Oh I was so frustrated. But just when I was about to resign myself to living in a Charlie Brown-sad-piano world, the good Lord sent me help in the form of a tiny, adorable 4 year old Austrian girl named Zoe. My husband and I were lucky enough to spend all of last week with Zoe at a Spiritual Growth retreat in Crikvenica, Croatia. Every time she saw us she would yell out our names and run as fast as could into our arms and proceed to ask question after question about our current status in the cutest German you’ve ever heard. Was machst du? Was machst du jetzt? Darf ich mit dein Telefon spielen? (She discovered Angry Birds on my phone and got addicted. So did her mom.) We learned so much from her. She refused to speak English with us, which was great because we were then forced to find words that answered her question. If we took too long to answer, she’d let us know. If we said something that didn’t make any sense, she’d let us know. If she overheard us say something to her parents in English, she immediately wanted to know what we said and we had to tell her in German. She was brilliant. And it was amazing for us because we were finally on the same level as someone else. Sure, that someone turned out to be a 4 year old, but hey. We’re great with that, and we learned so many new words from her than probably any adult we’ve spoken to because of how she unknowingly helped us log the words away in our memory. 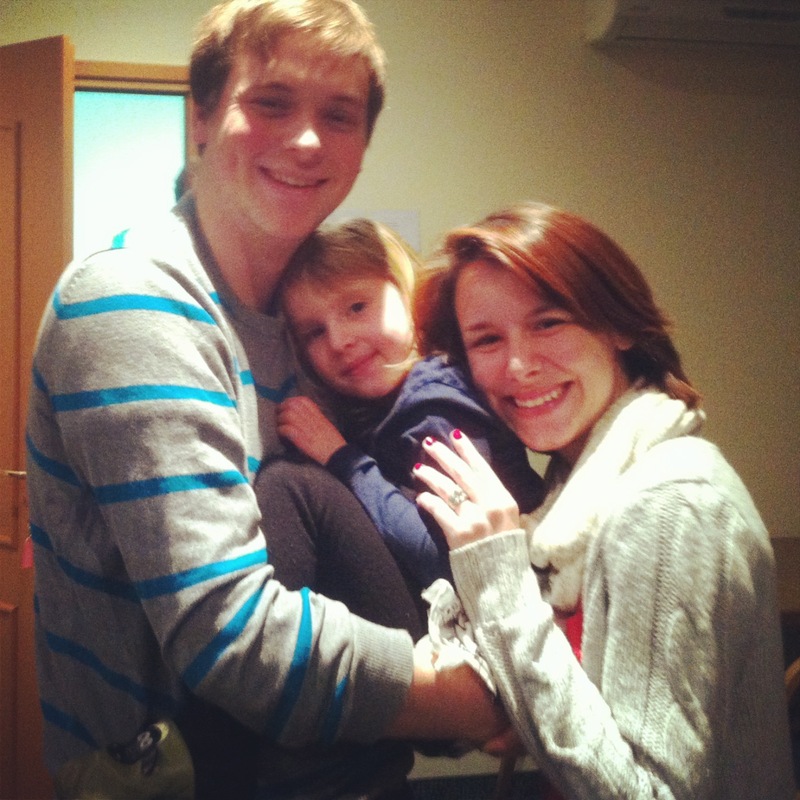 Will and me with Zoe. For example, Rock-Paper-Scissors (in German it’s Scissors-Rock-Paper) is her number one favorite game (aside from Angry Birds). We played it over and over and over again. Now if a kid wants to play Rock-Paper-Scissors, no problem. Schere-Stein-Papier. If I want to tell someone I tasted my food, I now know which verb to use because at dinner one night Zoe tasted her grated carrots like her mom asked her to and she thought the carrots were gross. I now know about ducks, best friends, games, butterflies, nail polish, favorite colors, “that’s not fair”, phrases to use while playing Tag, and how to tell someone I very much need to find a bathroom this instant or else – all in German. Will my next German conversation with a kindergartner go well? Absolutely. Will my next German conversation with an adult be as riveting? Well, unless we’re playing Tag or talking about butterflies it may not be as well spoken as the one with the kindergartner, but at least my confidence has been restored and my knowledge increased all thanks to little Zoe. She reminded me of the importance in trying and trying again, and how having a childlike knowledge about something is actually a ton of fun.